The Globalizing U.S. History project provides a two quarter innovative lower division curriculum for United States history reflecting new research on the impact of the world on US history and the impact of the US on world history. It seeks to align the major dates in U.S. history with world historical processes, among them the eighteenth-century Atlantic revolutions, the development of the U.S. national state, the struggle to abolish slavery, the fight for women's suffrage, and global patterns of migration. Between January 2005 and Spring 2007 more than a dozen UCSC graduate students of world history collaborated in developing a two quarter model globalized U.S. history survey course. It is being made available here to support and inspire the development of a new globalized U.S. survey for the 21st century. 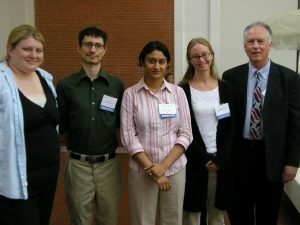 With guidance from the founding director of the Center for World History, Edmund "Terry" Burke III (right), four UCSC graduate students in History presented a new model curriculum for U.S. history to the June 2006 meeting of the World History Association in Long Beach. The panel on "Globalizing the U.S. History Survey" included papers by (from left to right) Sarah Doub, Anders Otterness, Urmi Engineer, and Eliza Martin. "Globalizing U.S. History" Part One is the Student Syllabus. It provides a complete syllabus of lecture titles and reading assignments for a two-quarter undergraduate U.S. history survey course, with core subjects conceptually connected to key developments in world history. We welcome teachers who wish to borrow from this curriculum. To encourage others to adopt this approach, Part Two, the Teacher Syllabus, provides a brief summary of each lecture, together with a brief bibliography of essential readings that would enable an instructor to present the lecture.